The National Council of Churches in the Philippines (NCCP), Philippine Ecumenical Peace Platform (PEPP) and Pilgrims for Peace led an Ecumenical Peace Forum at the Pastoral Center, Diocese of Cubao, Lantana, Cubao, Quezon City last September 13. Rev. Rex RB. Reyes, Jr. shared about the history of the peace ministry of the NCCP and the two networks where of which he also serves as the co-chair. Mr. Luis Jalandoni, who was then the Chair of the NDFP negotiating panel and panel member Connie Ledesma discussed updates on the first round of talks between the Government of the Republic of the Philippines (GRP) and National Democratic Front of the Philippines (NDFP) in Oslo, Norway last August. 140 people attended the said activity composed of NCCP member churches and Roman Catholic Church institutions and organizations. The Ambassador of the Federal Republic of Germany, H.E. Thomas Ossowski also graced the occasion. 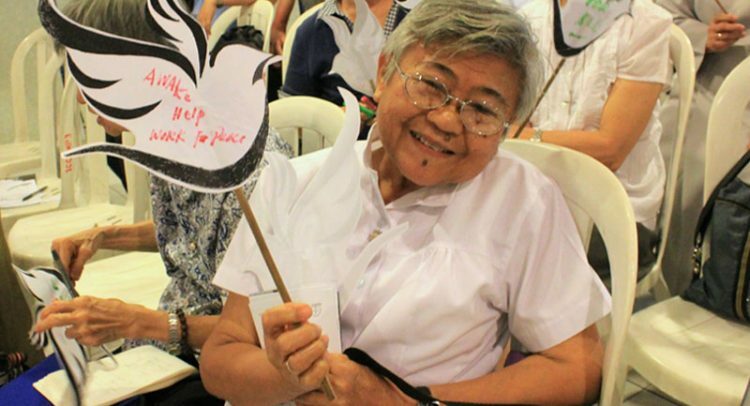 The Ecumenical Peace Forum was concluded by a symbolic action wherein the participants placed cut-out doves with their written peace messages in a banner with a call to support the peace negotiations. The facilitator of the forum was Fr. Ben Alforque, MSC, of the Pilgrims for Peace.